Looking for an antidote to the hectic pace of inner Bangkok? Palm Cuisine provides a quiet space to enjoy a meal and perhaps a Thai massage also. Hidden in a small sidestreet off Thonglor 16, Palm Cuisine is a relaxing refuge from the hurly-burly of frantic central Bangkok. The restaruant has a miraculously calming effect, on me, perhaps because the restaurant started its life as a spa. Gracefully, this soothing spa-ambience lingers in the restaurant. About 10 years ago, the classy spa-owners found themselves puzzled. Something was missing. As if hearing our silent wishes, they decided to start serving Thai food. 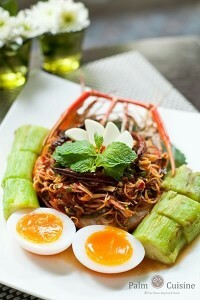 And Palm Cuisine was born — becoming an essential pilgirmage destination for all devoted Bangkok foodies. Instead of concrete, the walls are made of glass, which allows outdoor-elements to add to the ambiance indoors. Even the roof is transparent, so that the daylight — or the rising moon — has full access to the room. The atmosphere at Palm Cuisine is refreshingly quiet, as if light-years away from the loud and raucous boom of tweeters and woofers. I never considered silence a medium, but here it seems to have a distinguishable shape and sound. It is subtle, soft, inviting, and forgiving, It embraces the whole place. The restaurant is divided into two sections. One is devoted to families so that kids can be themselves and goof around as much as they like. The second room is a quiet area suitable for couples, business people, and individuals seeking a peaceful mealtime. The menu is refreshed daily by the chef, who follows the owner’s wishes. Honesty is the principle which can be seen in all food. Thus, there are no limp vegetables or day-old seafood at this restaurant. This freshness of ingredients is immediately apparent upon tasting. 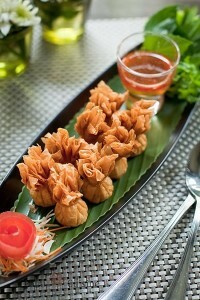 My first dish is a Thai starter: Thong Phet Tong Ploy, a crispy deep fried thin pastry packet of pork and herbs. The ultra-thin packet encased a morsel of moist pork and herbs. The crust simply disappears as soon as it rests on my tongue; leaving a pleasant long after taste..
Another famed Thai dish is green curry with beef. The beef is thinly sliced and cooked to perfection, the curry a delicate green hue. It bites back just moments after tasting, not in a shockingly spicy way but just enough to stimulate curry-sensitive tastebuds. Green curry is usually served with rice but a little twist was added to this dish. Delicate Chinese noodles function as the carbs of my plate instead; thankfully they do not disturb the harmonious, traditional flavor of the curry. My companion ordered fried snapper and presented with an enormous fish. Of course, I had to taste it too. The fish’s crispy brown skin yields to the fork and reveals the pearly white flesh. The superlative dish was perhaps the best fried snapper I have every tasted. Palm Cuisine is worth visiting for this dish alone. Moreover, I can recommend without any hesitation, the pla gung mae nam makuea yao pao kai tom (river prawn with a spicy herb salad and grilled egg plant). Cooked to perfection, their delicate taste is not overshadowed by too many herbs, but they leave a curious lingering taste long after eating. Lastly, the dessert. Nothing could be more appropriate to follow a traditional Thai meal than a traditional Thai sweet. This treat is usually ahrd to find: matoom cake, made from bael fruit topped with caramel and garnished with peanuts. On the side, bael tea completes this wonderful dessert set; and my utterly relaxed meal at the Palm Cuisine.